Anti-poaching patrols and removing snares from their rainforest haunts have helped their population grow by more than 300 over the past decade. The remarkable success story today sees the mountain gorilla being removed from its critically endangered status on the Red List of vanishing creature. It is now classed as endangered. While being hailed as “fantastic news” by conservationists, the gorilla, found in two remote areas across the Democratic Republic of Congo, Rwanda and Uganda, remains only one disaster from following the dodo, great auk and passenger pigeon into oblivion. The recalibration of the mountain gorilla’s status was announced today the International Union for Conservation, custodians of the Red List of Threatened Species. It joins the formerly endangered fin whale in having its status upgraded. Fin whales are now listed as vulnerable to extinction, having doubled in numbers globally since the 1970s because of bans on commercial whaling. Yet many plants, trees, fish and other organisms continue declining in worrying numbers, with 26,840 species out of the 96,951 assessed for Red List classification labelled as critically endangered, endangered, or vulnerable. Since Sir David Attenborough had his legendary up close and personal views of mountain gorillas for the Life on Earth television series in the late 1970s, the powerful but retiring primates have achieved iconic status as a tourist attraction while suffering an onslaught from poaching, civil unrest, habitat destruction and human diseases such as ebola. Intensive conservation efforts across their 300 square mile range – spread across two locations, the Virunga Massif and Bwindi-Sarambwe – need to be maintained, says Dr Liz Williamsom from IUCN’s primate specialist group. “While it is fantastic news that mountain gorillas are increasing in number, this subspecies is still endangered and therefore conservation action must continue,” she said. 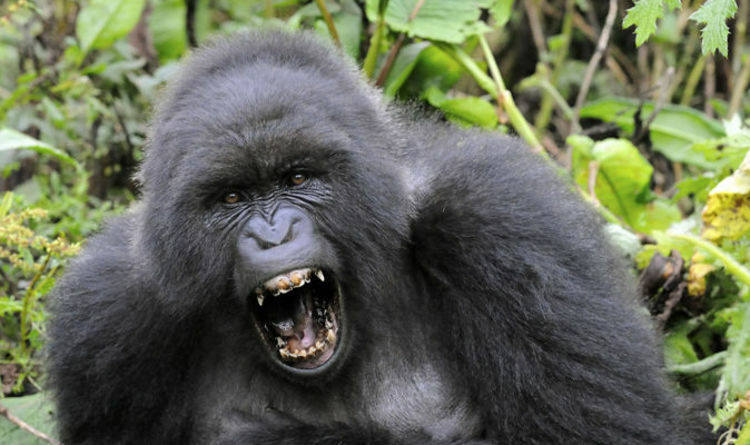 The mountain gorilla’s closest relative, the eastern gorilla, remains critically endangered. Conservation group Fauna & Flora International (FFI), which has been operating a programme to protect gorillas and their habitats with the WWF for the past 27 years, says efforts should be enhanced not weakened after today’s Red List announcement showed an increase from 680 individuals in 2008 to more than 1,000 today. Matt Walpole, FFI’s senior director of conservation programmes, said: “The increase in mountain gorilla numbers is the result of day in, day out, hard work by dedicated conservationists. “Mountain gorillas remain threatened with extinction despite significant conservation efforts over recent decades and we have to make sure we build on these achievements and not allow this success to become an excuse for weakening protections. “Many threats to mountain gorillas remain including illegal trapping, irresponsible development, disease and climate change. Tourism can – and has – played an important part in enhancing mountain gorilla protection, but it needs the right support and safeguards to continue to do this. Despite recent reports of a fin whale being killed by whalers from Iceland, the planet’s second largest living creature has seen its numbers rise to 100,000 mature individuals, leading to the change in conservation status to vulnerable. The western sub-population of the grey whale has also improved, moving from critically endangered to endangered. Rothschild's giraffe, restricted to small areas in Kenya and Uganda, has improved from vulnerable to near threatened with a ban on hunting and reintroduction efforts bolstering populations. Yet overfishing and logging are driving serious declines of fish and plantlife. Thirteen per cent of the world's groupers and nine per cent of Lake Malawi fish are now threatened with extinction, while illegal logging endangers the survival of the vene tree in west and central Africa. Logging and the conversion of Sumatran forests to palm oil plantations sees the titan arum, or corpse flower, so-called because of its pungent odour, being listed as endangered. North America’s largest tortoise, the Boston tortoise, has had its vulnerable status upgraded to critically endangered because worrying numbers are being eaten by communities in Mexico's Bolson de Mapimi basin.